Apparently Charles Rollo Peters and Kathleen were a love match and around the turn of the twentieth century they lived an idyllic and Bohemian life in their estate that overlooked the sea in Monterey. Drawn by the beauty of the ocean; the beaches; the moody, magnificent cypress and pines, many of their artist friends came to stay and paint and party at the estate that became known as “Peters’ Gate.” (The house — much altered — and stone gateposts still stand today on Munros hill.) Gradually more and more artists congregated in Monterey, turning the picturesque little town of adobes into a flourishing artist colony. 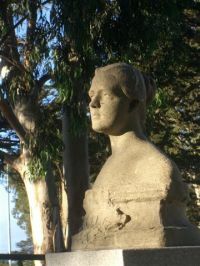 As I researched Charles and Kathleen’s life in Monterey, I discovered that there were a surprisingly large number of women active in the colony. I fell in love with their sunny colors and the vibrancy in their brush strokes as they painted in the style that came to be known as American Impressionism. I also found myself wondering what it would be like for a woman to make her way as an artist in the early nineteen hundreds. I know from being a career novelist how challenging it is to balance the demands of being a creative and a woman. It made me wonder what difficulties a woman might face in becoming a serious artist a hundred years ago. Was she accepted as an equal? What sacrifices might a woman be forced to make to fulfill her ambition of being a painter? And therein — I thought — might just hang a tale worth telling. Though I am not ready to talk about it yet, that appears to be the historical direction the next novel is taking. I will tell you that the Peters will probably not make more than a cameo appearance in the book, because their story is so sad. In 1902 their charmed life shattered when Kathleen died after giving birth to twins. Two years later their baby daughter, also named Kathleen, stumbled into an open fire and perished. Charles was inconsolable at the depth of his loss and commissioned the beautiful grave marker for his wife and daughter. He continued to paint for another twenty-five years and went on to even greater fame and fortune. But in many ways his life was empty without his first love and their baby daughter. 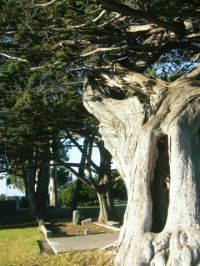 Little did I know when I paused beneath a row of towering eucalyptus trees to look at Kathleen’s grave, that in the rattle and rasp of the leaves fluttering overhead I’d hear the whispers of a story.